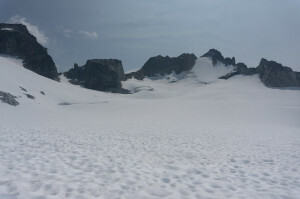 Located in the wilderness between the Suiattle and Cascade Rivers, Dome is one of the most remote of Washington’s highest 100 peaks. 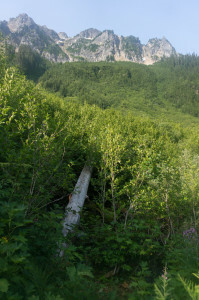 While the Suiattle River Road was washed out, it may have been one of the most remote peaks in the lower 48. However, when the road finally reopened last fall, it returned to being a long but reasonable dayhike from the Suiattle via Downey and Bachelor Creeks. I wanted a “real” day, and was still looking for excuses to delay a return to the Pickets, so Dome it was. Food locked away, I slept just past the Downey Creek trailhead, currently occupied by what I thought might be a trail crew, then returned for a lazy start around 5:20. The trail climbs to a sort of bench above Downey Creek, then gradually returns to the creek via side-hill. Having started late, I jogged the downhills and flats to make up time. This part of the trail was well-built back when the Forest Service did that, with numerous boardwalks over the swampier sections and good log bridges, and is still well-used and -maintained. 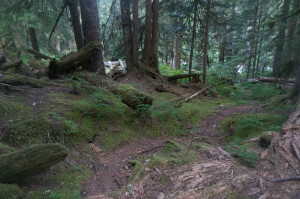 After about an hour and a half, I reached the fairly obvious Bachelor Creek trail junction and started climbing. 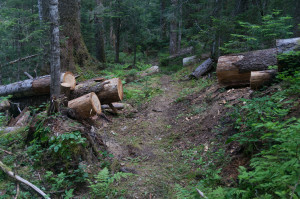 This trail has a reputation for horrible brush and blowdowns, but I found the first part surprisingly easy going, and even saw some logs apparently cut within the last 5 years. I began to look forward to an easier-than-expected day. My unrealistic optimism about the route was rudely corrected as it emerged from the forest into long slide areas on both sides of the creek, choked with berry bushes, devil’s club, and alders. 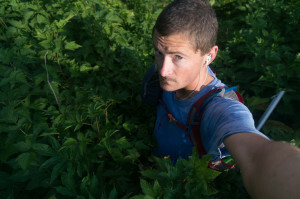 The trail remains fairly distinct and well-flagged, but the head-high brush is usually thick enough to hide the ground and one’s lower body. Some of the lower branches had broken off and died lower down; angled along the trail, they became vicious and invisible shin-spears when confronted in the wrong direction. After crossing a log from brush to equally bad brush, and passing through the blessed relief of some alder thickets, the trail finally enters open forest where the creek flattens and turns back northeast. Unfortunately, the brush is replaced by constant blowdowns, so progress continues to be difficult and slow. Near where the creek finally turns back southeast, the trail enters open heather on the ridge to its right, and smooth travel and open views soothe the bushwhacked soul. From a saddle near 5,900′, the trail descends to Cub Lake at 5,300′, finally getting the first view of Dome’s summit in the distance. Bypassing even-lower Itswoot Lake, a well-established trail crosses some flats, then climbs heather next to a cascade to reach Itswoot Ridge around 6,200′. 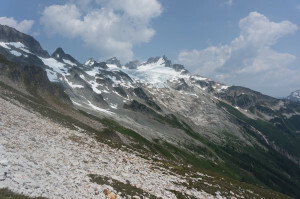 The view steadily improves as the Dome Glacier icefall comes into view, and Spire Peak looms at the head of the ridge. I was expecting to meet a party I had noticed in the trail register, but had the well-traveled route entirely to myself. From the ridge, Dome remains discouragingly far away. After a long traverse down around a couple of rock buttresses on slabs and heather, I made my way up a random assortment of snow, talus, and slabs to the western edge of the glacier near 7,000 feet. Though it looks mostly flat, the broad glacial plain leading toward the summit is steadily uphill; reaching it at mid-day, I found it a long, exhausting slog to the col north of the summit. There were some old bootprints, one set making a beautiful ascending traverse up the steep snow-slope to the col between the northeast (true) and southwest (false) summits. 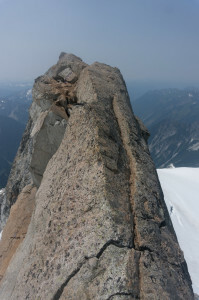 Near the col, I wrung out my socks and warmed my cold feet on the rocks, then followed the third class rock ridge to the summit. The final 30 feet is a beautiful exposed catwalk; I was disappointed, but not surprised, to see unsightly rappel slings left by people avoiding it on the return. The heat wave continued: the south side of the summit was uncomfortably warm even in shorts and a t-shirt, while the north was comfortable for an extended stay. I tried to enjoy the views, but Canada had recently caught on fire, so I could see nothing beyond Eldorado and Bonanza, each about 15 miles away. This supposedly qualifies as “generally good”, but I am not sure I agree; it reminded me a bit too much of Houston and LA. Retracing my steps, I found a mostly-snow line down to the long traverse, saving lots of time with fast plunge-stepping and boot-skiing. The climb past Cub Lake was a grind, but passed more quickly than I had expected. The bushwhack was still over an hour on the way down, but at least it was easy to stay on-route, and I had enough podcasts to put my mind elsewhere as I picked my way through the green hell. Jogging the final open section down to Downey Creek, I saw that my “trail crew” was in fact a NOLS group. You could tell by the big plastic boots, heavy things like dutch ovens, and communal gear — big tube tents, bags of oats, etc. They were about 20 days out, having probably resupplied on the Suiattle River Road after coming down from Glacier Peak. 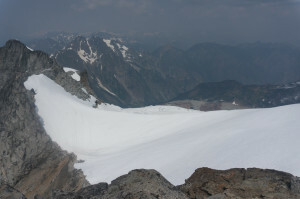 Their plan was to traverse Dome and exit to the PCT, probably descending the heavily crevassed Chickamin Glacier and bushwhacking through some hellish creek to the east. They seemed to be in good spirits, but at the rate they were going, it would probably take them a week. After stopping to remove my pant legs once more, I put on some aggressive music and jogged much of the trail back to the car.